"Hank ever so slowly eased across the water and was again at the armpit level when all of sudden the current pulled his feet out from under him and he got sucked downstream. 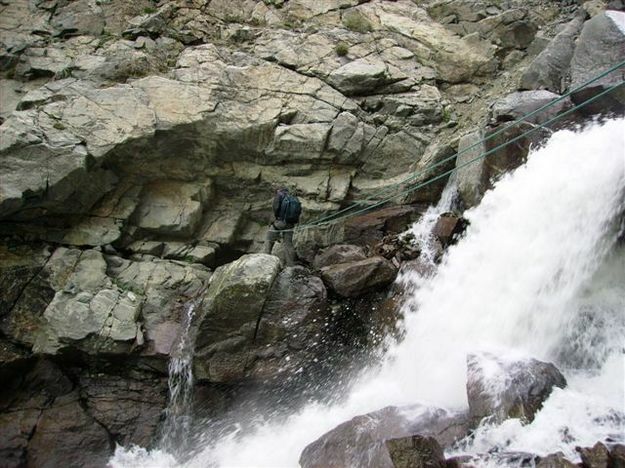 I began to panic because the elasticity of the rope was pulling him further than I expected and he was heading straight for the waterfall. 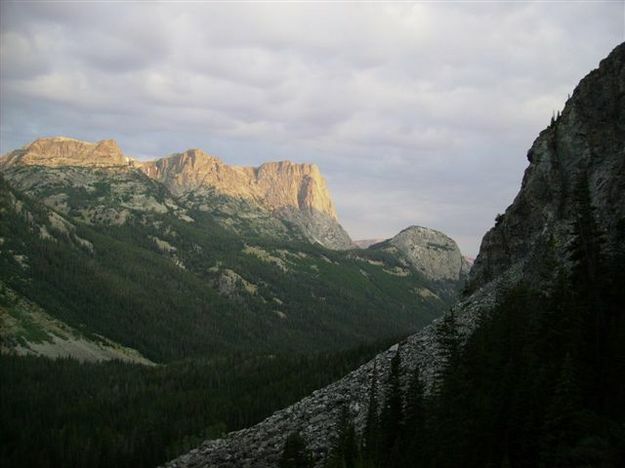 If he let go of the rope he was over the edge and probably in big trouble…"
My trip to ascend Wyoming’s tallest peak actually began in the summer of 2007 when I teamed up with Hank Williams to try the summit in one day from the Green River Lakes Trailhead. We had hopes of making the trip in less than 28 hours, but due to many factors, we were unable to reach the peak early enough in the day to make it off safely before sundown. Although it was a disappointment to miss our mark, the trip still turned out to be one of my grandest and most humbling adventures. It all began the evening before as we set camp up in the Forest Service campground and had a hearty dinner of spaghetti and meatballs that my wife had premade for our carbohydrate infused meal. We hunkered in for the partial night of sleep we would get and then were up and at ‘em around 1:30. Our plan was to leave early enough in the morning and walk in the dark on the well-maintained trail until we would depart its security around first light and maneuver our way up Tourist Creek. I still have no idea why the name Tourist Creek was ever considered as a name for that drainage. Maybe because it has claimed the lives of many tourists, but nonetheless it was a challenge in itself and our timing was perfect for the scramble through the rock slides and creek crossings at first light. As with our one day trip to Fremont Peak we were carrying very little supplies, mostly some food and emergency survival stuff. Hank was loaded with a few climbing ropes and, although I don’t remember any mention of it specifically, I am sure he let me know that he was carrying a bit extra weight. We made our way up through Tourist Creek in about 4 hours and passed south into a small saddle that separates Tourist from Wells Creek. We were warned by our good friend Casey Saxton not to use Wells Creek and avoid it at all costs. I am not sure if he had ever used that route as a sheep hunting guide before, but the warning was good enough for me. The scenery was awesome from the top of the saddle as we peered down into Scott Lake and the basin. 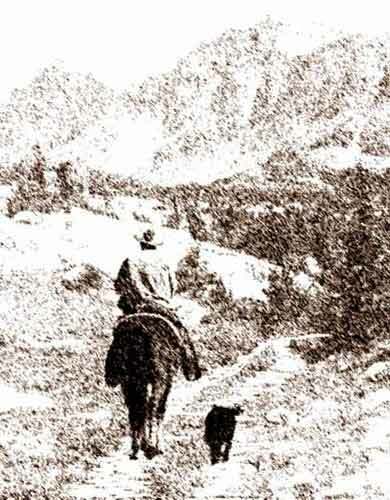 I was walking ahead of Hank and as I rounded the corner turning west the magnificent peak that we had come to conquer was coming in to sight. I traveled a bit further to get the entire mountain into view before setting down for some lunch and rest while Hank caught up. It appeared to me that we still had a pretty good jaunt to get across the basin and begin our accent, but sometimes those things can be deceiving. It was pressing 11:00 am when Hank caught up and by the look on his face I knew that something was bothering him. As he sat down he explained to me that he was not expecting a large snowfield that interrupted our route on the side of the peak that lay before us. Of course we were going as light as possible and did not think we were going to need any ice axes or crampons, so we had left them back at the camp. Needless to say we were concerned about attempting the route without them. We finished our lunch while contemplating our situation and after much turmoil determined that with the time of day and the risk of attempting the climb without the security of ice equipment, it was much wiser just to turn back. In all honesty I do not think we had enough daylight to make it off the peak even if we would have had the right gear. Another element that weighed into our decision was that my headlamp had broken on the walk in that morning and I was having to follow right behind Hank without any distance just to pick up enough light from his headlamp to make it down the trail without stumbling. A late night walk off of a steep rugged hillside would be much more dangerous. After making the decision to turn around we actually soaked up some sun on a flat rock and caught a 30-minute snooze. As we gathered our gear up we nonchalantly decided to explore our way down Wells Creek since we had plenty of daylight left and we still had some bent up adventure in our bones. Making this decision was the turning point for our less than exciting trip, so far, to turn into an unforgettable trip. 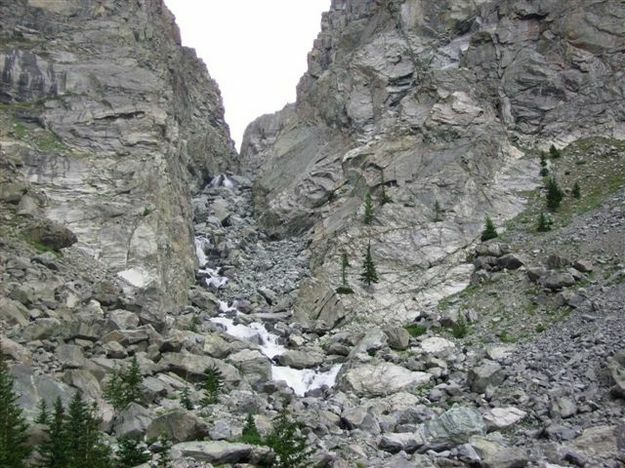 The head of Wells Creek was pretty typical of most any other drainage in the Wind River Mountains. Some sheer cliffs that have broke and fell created maneuverable routes in just about any direction to get to the bottom of the creek bed. From there we snaked back and forth over the boulders that acted as bridges across the creek. Wells Creek was actually flowing at a pretty good lick and for the most part we avoided getting wet. As we descended, the drainage kept getting narrower and narrower with less of the cliff sloughing that was so beneficial early on. Eventually we came to a place that we needed to cross without the help of any natural boulder bridge. We located a crossing that appeared passable even though we could not tell how deep the water was because of the raging water and glacier silt that the creek bed absent from sight. There was a small but scary waterfall after the flat crossing that dropped about 25 feet and above our crossing point was a cliff edge that came right to the water’s edge. We determined that this was the best spot to cross although without being able to see the bottom would pose some challenges for foot placement. It was going to be completely by feel one step at a time. Without unloading any of his gear, Hank took the first couple of steps with the water level becoming surprisingly deep within the first 5 feet across. Wisely he backed out and we set up a rope bale to keep the crossing person some security for balance as well as a safety precaution for recovery if they lost footing. Again Hank began to cross and, although the 20 foot crossing seamed easily doable with our rope system, the rocks were extremely slick and the current made it difficult to maintain balance. About halfway across, the water depth was up under his armpits and he immediately lost his footing. The rope worked well and he regained a foot hold to bring his soaking wet body back to the surface while returned to the edge from where he had started. The glacier water was extremely cold and with the frigid baptism Hank instantly began to shiver. At this point I was thinking about Casey’s recommendation of avoiding this drainage and the thought crossed our minds to turn around and back track. Of course it was pressing on 5 o’clock by this time and we were somewhere around 2 hours from the top of the drainage and another 4 hours down the Tourist Creek side which would be cutting it close to escape the darkness and make it to the trail with only one headlamp. I decided to give the crossing a try so Hank and I switch roles and I eased off into the water. Man was it cold. It cut through my clothes like I had nothing on and instantly my legs began to burn from the frigid temperature. As I eased across the water it was slow going not being able to see how deep your next step would land you. I inched forward slowly not wanting to slip and end up with my head underwater like Hank did. Again I was up to my armpits in the chilly water and if only I could jump I would make it to the other side. Of course that is impossible when you are that deep in the water, so I inched forward a bit further without getting too much deeper and only 5 feet from the other side. I decided to make a moon walk leap and as I did I surprisingly was able to grab some rocks on the other side and pull myself up and out of the ice box. What a relief. By this time Hank was shaking and shivering pretty bad but I knew that if we could just get him across the water we could get moving again and he would warm up in no time. We still had 4 hours of daylight and although we were in a deep canyon, the sun was still peaking over the highest ledges shedding a few rays of warmth. We rearranged the rope and Hank reluctantly stepped back into the water. I decided to grab my camera and snap a few shots of the crossing since it was worth documenting. Holding the camera in my right hand and the rescue rope around my waist and left hand I was ready for some action footage. Hank ever so slowly eased across the water and was again at the armpit level when all of sudden the current pulled his feet out from under him and he got sucked downstream. 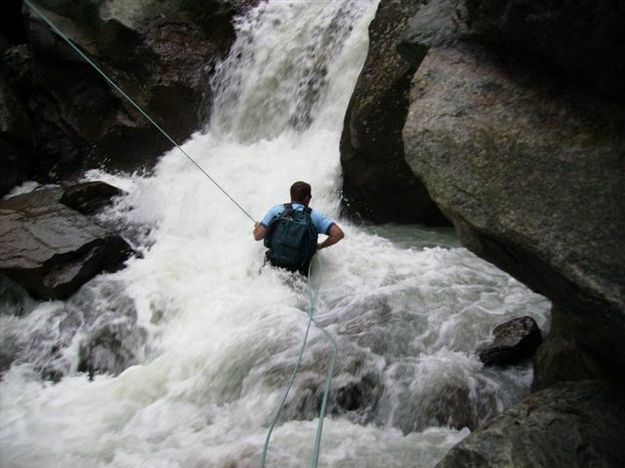 I began to panic because the elasticity of the rope was pulling him further than I expected and he was heading straight for the waterfall. If he let go of the rope he was over the edge and probably in big trouble. Not having much ability to help I just hung on to my end of the rope resisting the pull of the current as Hank’s soaked and wet body strained my footing. I am not sure if it was the reaction of my finger or stupidity but I did manage to snap a couple of pictures of the excitement and they will be forever cherished in my album of adventures. Of course Hank survived the fall and never did go over the edge. He regained his footing and ended up pulling himself to safety even though it was the side that he started from. He was saturated, scared, and cold. We were still on opposite sides of the creek and the rushing water and sound of the water fall left me shouting words of encouragement for him to try again. His hesitation was insurmountable and our only choice to get him across was to find another route. After two falls and a near death experience, he was not going to attempt the same crossing again. After a breather and regaining some composure we decided to move down the creek below the water fall for a look at a secondary route. 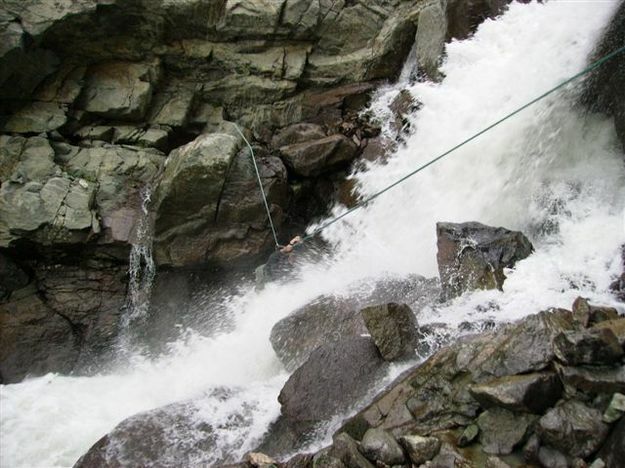 The only option at this point was to hang a high line from one side to the other at the height of the water fall and have Hank pull himself across on the rope while hanging upside down, just like in the movies. This was a much wider crossing but appeared to be our last option without having me go back across and retracing our incoming route. Although full of fear of falling and extremely cold, Hank was able to pull the courage together and began his crossing. He pulled with his arms and with his legs looped up over the rope, was making some great progress. The further he made it to the center of the strung rope the more it was sagging which ended up with his body again being pounded by the icy cold water of waterfall. As I observed I was able to capture some more pictures of the cold crossing and as Hank reached my side we both breathed a huge sigh of relief. At this point we still were not sure how much distance we had left to descend the treacherous drainage before running out of natural light. We did know that we needed to keep moving for the sake of time and of hypothermic. Hank was extremely cold and wet and movement was the only thing that was going to warm him back up. 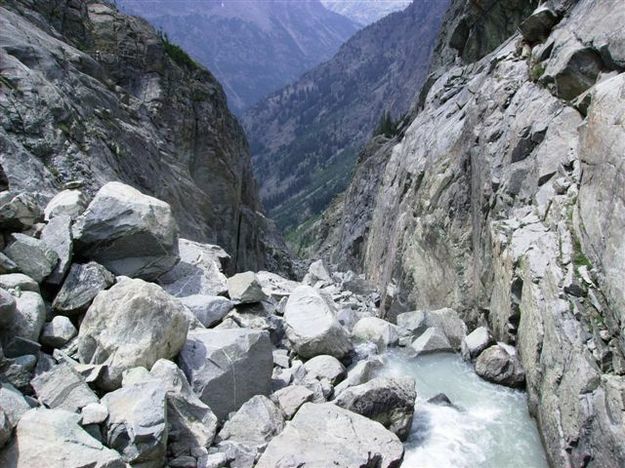 The remaining trek proved to be much more boulder hopping and loose shale slides. The huge boulders that had collapsed from the sides of the canyon walls made it slow going. It seemed like forever, but we eventually neared the bottom of the canyon and back to the Green River. This crossing, although much wider, was a walk in the park from what he had been through. The last glimmers of light disappeared as the cool night air moved into the valley at Three Forks Park. 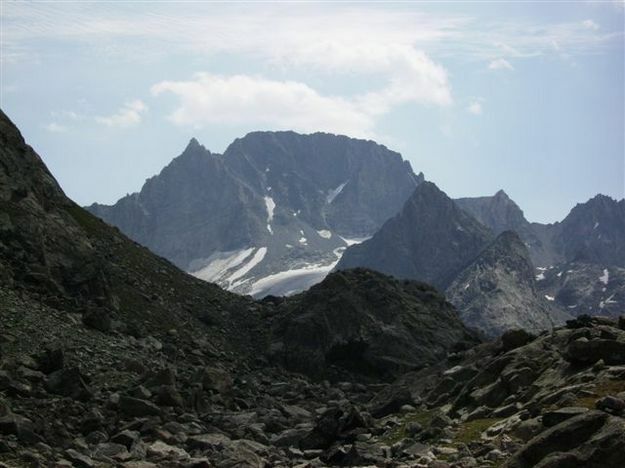 We had arrived back to familiar ground and had found the well-traveled High Line Trail which would guide us back to our camp within 4 or 5 hours. With exhaustion setting in we had no other option but to line out down the trail. A trace of moonlight helped me avoid some of the obstacles in the trail as I again walked on the heels of Hank with the aid of his headlamp. Click on small thumbnail pictures to see a larger version. Copyrights: Photos and stories by author James Rogers, 2001-2009, unless otherwise noted. 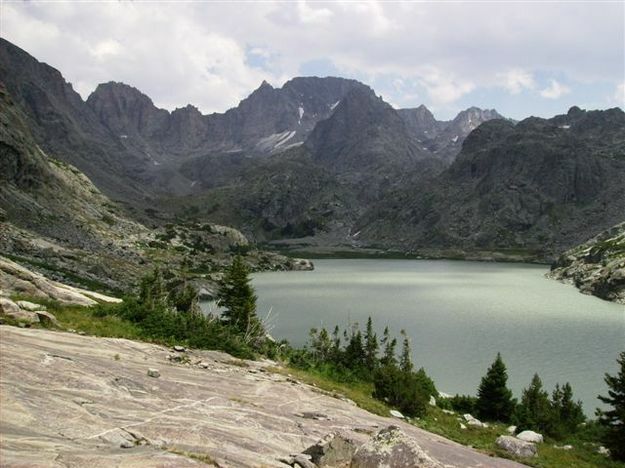 Off the Paved Road is an outdoor column sponsored, hosted and copyrighted by Pinedale Online. Graphic artwork for Off the Paved Road by Pinedale Online. No part may be reproduced without permission.